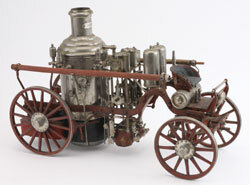 Fire pumper model, spirit fired and believed fully functional, 21 inches long, weight 32 lbs., $8,260. 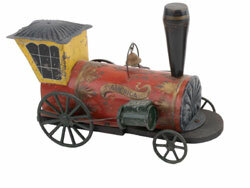 Noel Barrett Auctions image. This entry was posted on Tuesday, June 28th, 2011 at 3:06 pm	and is filed under . You can follow any responses to this entry through the RSS 2.0 feed. You can leave a response, or trackback from your own site.